All rides end at 7:15 am. Post ride coffee @ Shoal Point Moka House. There are A, B and C rides. A-Group Average Speed: 35-38 km/h. Route: Shelbourne, Blenkinsop, around Mt. Doug, up Ash Road, back along the waterfront. Usually a strong pace line to Beacon then all out for 6 laps around the circle. B-Group Average Speed: 30-34 km/h. Route: Same as the A group. Two up pace line back to Beacon Hill Park, finishing with four laps of the park. C-Group Average Speed: 26-28 km/h. Route: Same as A & B ride, except continue straight on Shelbourne, turn right on Ash Road, back along the waterfront. Finish with no drop pace line down Dallas from King George then all out for a couple laps of Beacon Hill Drive. We always ride to the pace of the slowest rider, making this a great ride for an introduction to group riding. A & B Routes: (starts at Oak Bay High) Shelbourne, Blenkinsop, Waterfront. 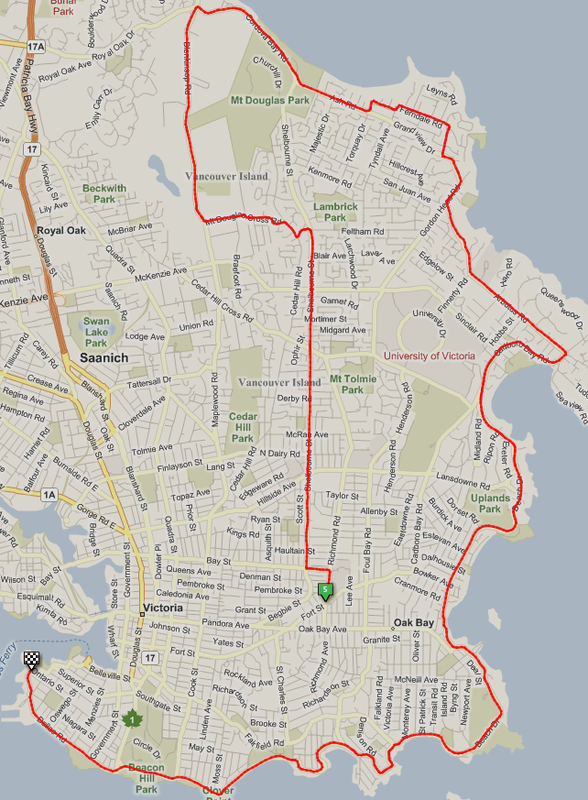 C Route: (starts at Oak Bay High) Shelbourne, Waterfront. Same as A and B rides, except continue straight on Shelbourne, turn left on Ash.